I have finally found a web page translator for the Scandinavian languages to English. I have been on a mission to find the perfect translator for the Scandinavian languages for quite sometime trying various ones such as Google Translate, AltaVista BabelFish, and WorldLingo to name a few. These are great tools, but not one of them have any translation capabilities for the Scandinavian Languages. This past week, I was blessed to finally come across a translator called GramTrans that is designed through a cooperative effort between two small companies specializing language technology, GrammaSorft ApS (based in Denmark) and Kaldera Språkteknologi AS (based in Norway). The geniuses behind this remarkable site are Eckhard Bick, dr. phil., computational linguist (GrammarSoft ApS), Lars Nygaard, language engineer (Kaldera Språkteknologi AS), Tino Didriksen, free-lance programmer (A Howl on the Wind). Technology is shaping the genealogical world, making the search for our ancestors far more simpler than when our parents were trying to connect with their ancestors just one generation past. We are very fortunate to be able to live in this time when the world is becoming smaller and allowing us to meet and connect with cousins across the globe. My experience with GramTrans was amazing this past week. I was contacted by someone who was helping me with my Danish Enevoldsen line where I have hit the proverbial brick wall. I found this person on the DIS Danmark Forum but the entire page was in Danish. I utilized the translate URL feature of GramTrans, and in a matter of seconds, the entire page was translated into English. It was miraculous and for me an answer to many prayers on how to proceed in finding my Danish ancestors. This site will help me to read the information in the Danish Archives more efficiently and accurately. As you can tell, I am very excited and pleased that I found the GramTrans site. The languages available for translation are Danish, English, Norwegian, Swedish limited Esperanto and Portuguese. The site has three different subscription levels including Free (limited use), Personal (unlimited use and browser plug-ins) and Commercial Lite (unlimited use, browser plug-ins, allows indirect commercial usage). You can translate an entire web page or just a few words. Another great feature of this site is that you can also contribute words to the site. 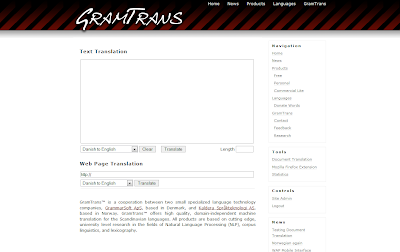 You can try out the the translation capabilities by viewing the home page on GramTrans. Have great fun!